Experience the Wild - Bird Watching Tour Testimonials and Feedback. If you have enjoyed a tour with us and would like to leave a comment, please feel free to do so here. Below are some recent feedback comments we have received. You and Ian made a good team with thorough knowledge and experience of all that you described. Any time you have professionals with the expertise you both possessed will make for a great experience, and we were certainly not disappointed in this regard. You had everything so well organized that the tour ran seamlessly. We also congratulate you for your consideration and kindness towards all of us in this diverse group. 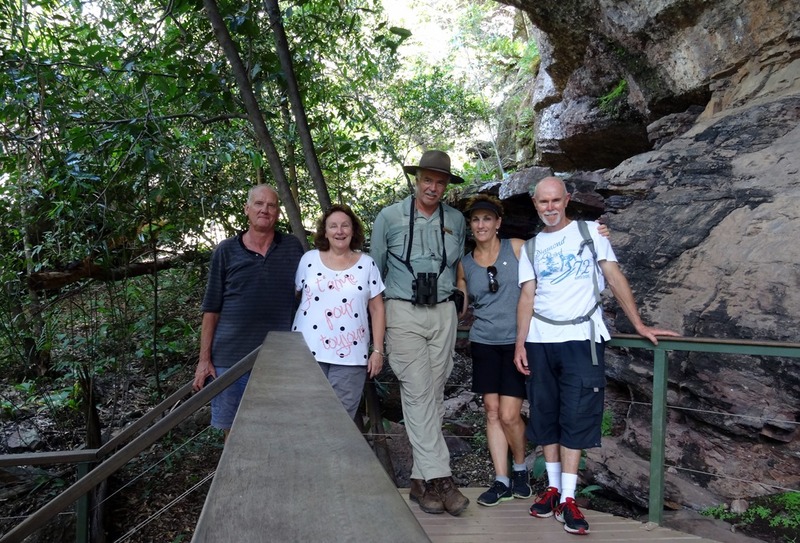 A sincere thank you for a wonderful tour through Kakadu, the four of us thoroughly enjoyed it. Your knowledge, commentary and warmth were very much appreciated. There were many highlights, and time will allow us to savour them more fully. Especially impactful was the walk to see the rock art in Nourlangie- wow, that was something, made all the better by your explanations. It was certainly a spiritual experience never to be forgotten. Dawn and I look forward to reading all the books we purchased, and our family loves the exquisite, large artwork we bought at Cooinda. My sister Lindy has also fallen in love with Aboriginal art and she purchased some beautiful artwork at Parap Markets before we left yesterday. We hope you have recovered well, as you put so much into your work. We know what it’s like when you share your passion, so you deserve a good rest. Also a big thank you to Jenny for the best food we had while on holiday. Dawn and I particularly appreciate your consideration Jenny, as we were really hanging out for some raw salad and avocado. It was like water to a thirsty person! It really added value to the tour. And Mike, would it be possible to purchase 2 sets of binoculars, one around the $500 and one around the $250-300 mark from you? We are keen to start bird watching. I have also attached a number of articles as promised on various health topics fyi. From one passionate couple to another! Again, thanks for your valuable input to our wonderful visit to the Top End. Margarita and I had a wonderful time (yes we were really warm) on our city tour of Darwin and then for a day trip to Litchfield Park. Feel free to use this note for potential clients or however it may be helpful to you. “Experience the Wild,” a Darwin and Top End nature touring company is owned by Mike and Jenny Jarvis who are wonderful tour guides and hosts. My friend Margarita Kim and I came to Darwin during the Monsoon season when no one normally engages their services. We luckily did not have much rain but the heat and humidity for two Seattle-ites was a bit of a shock. Nevertheless, we had an excellent day in the outback stopping at an Art Centre in Bachelor and having a picnic lunch (homemade by Jenny) outdoors in the Litchfield Park. Mike clearly loves what he does and is particularly expert about bird watching and the animals one sees in the outback. I said that I was learning to use my ears more as a result of Mike and his ability to identify the song of every bird we heard. I would highly recommend the company for their professionalism, thoroughness and care that they took to make our experience both enjoyable and memorable. It was a pleasure meeting both of them. Thank you Mike for a wonderful morning of bird watching while I was in Darwin .. it was certainly the highlight of my visit! I will be back again! Mike Jarvis guided us recently through Northern Territory for the Tourism Australia National Landscapes Nature Series. It was a real pleasure for us to spend time with Mike. We are generally quite undemanding but Mike was always on hand with that cup of iced water, a coffee early in the morning and a friendly smile, balancing with his knowledge and enthusiasm for the birds and animals of the area. Ellen and I did enjoy our tour with you very much. I think we saw more birds, photographed them in better light, learned more about them and other things about Australia than all our other tours combined. Thanks again for the ‘expedition’ summary. That will be a good reference in future years of the trip. And if it should come up, we’ll send our adventuresome birding friends in your direction. 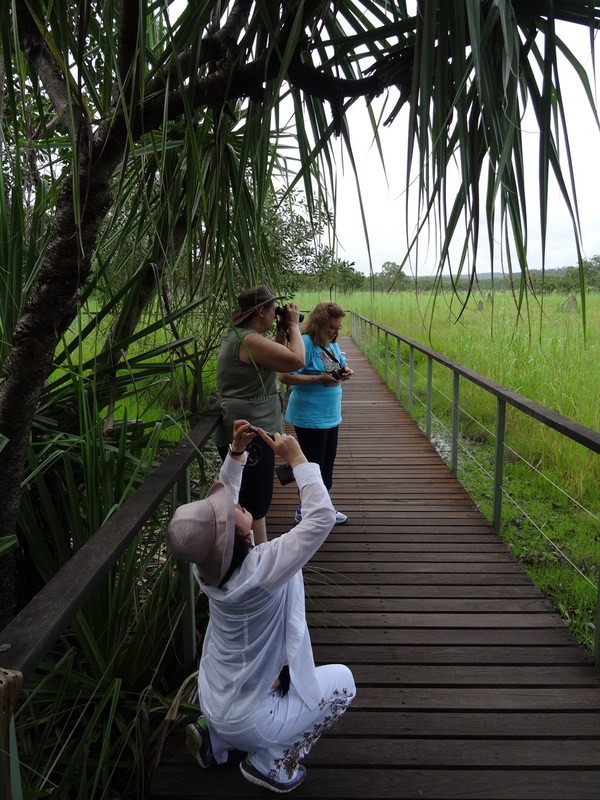 Thank you for the recent bird watching tour around Darwin, Fogg Dam and Mary River. I found the tour to be very enjoyable and most enlightening, especially the expert and informative commentary, along with your knowledge of the local area, vast array of bird species, behaviour and habitats. Some of the highlights were seeing the Rainbow Pitta and the Gouldian Finch. I enjoyed the comfortable, air-conditioned 4WD and food and snacks provided. The highlight of the day was sundown at Fogg Dam, where we observed a 3 metre crocodile leisurely swimming around the water hole at sunset and many species of birds coming in to feed. Mike, this was my first birding experience and it has whet my appetite for more, so will look forward to joining you again. Time flies when you are having fun or not. I apologize for not writing to you sooner. Paula really enjoyed her “day” of birding. You really made an extra effort to maximize our “half” day with great success. This bridge cruise assignment was our best ever from both a bridge and a birding experience. Paula especially enjoyed the Red Winged parrot, the Dollar bird and the Rainbow Feeder that you found for us. We had great success at theDarwinbotanical gardens. We wandered out of the north end of the park towards the beach and were amazed to come across a flock of Red Tailed Black cockatoos feeding on the ground right in front of us. With the help of Richard Nowotny on our day inMelbournewe saw over 200 species and identified 198 (Paula’s goal was 200). Paula added 131 life birds on this trip. What a nice touch it was to end the day at the beach sitting at the picnic table and watching the sunset sipping wine and munching munchies. We thank you for all you did for us in the short time we had and would certainly recommend your services to anyone travelling to Darwin. Thank you very much indeed for this wonderfully detailed and professional report of our bird spotting trip with you in Darwin. It is the icing on the cake ! We have forwarded it to our younger daughter and her partner who are both enthusisatic birders and they are hugely impressed and envious and are resolved to visit Darwin to do the same. When you have a Trip Advisor site it would be our pleasure to write a glowing report so that others can enjoy the experience as much as we did. In the meantime, please feel free to use any quotes from my earlier email as testimonials. Alternatively, I would be happy to write and forward something independently that you can use. The rest of our Australian tour went very well but all too quickly. We greatly enjoyed Uluru, Kata Tjuta and King's Canyon and sleeping under the stars; were very taken with Perth and Fremantle and had an excellent day trip to the Pinnacles desert. We are now well and truly back in the UK in what passes for Spring, i.e fairly incessant rain and daytime temperatures considerably below the coldest Darwin night. However, we have the consolation - and the photographs - of our unforgettable time in Australia, of which our half-day trip with you was a highlight. All best wishes for the success of your venture. I Have to say, Experience the wild tour, was an experience that I will never forget, I Have to agree Mike the getting stuck was the high light,but saying that, you also left me with an appreciation of the bird life so much more, I have to thank you for that. For anyone out there that really isn't into bird life, certainly go with Mike & Jenny,you get to understand variety,sound and just the excitement of nature, Keep up the good work, Mike & Jenny you both are amazing. Thank you for your Email. We really did enjoy our day with you. We saw so many fantastic birds & wild life that we had to buy a field guide before leaving Melbourne so we could recall everything we saw. It sounds like we left Darwin just before the rainy season started, we were very lucky with the weather, for all of our holiday. We have no problems recommending your company to our friends, & if we are ever lucky enough to return to Darwin, we will certainly sign up for another day trip out. Perhaps we will see you or Chris at next year's Bird Fair at Rutland Water, we will look out for you. Thank you very much for the trip reports. I would like to thank you not only for showing me the birds, but also for your friendly helpful approach. I have learnt a lot - not just about birds - my passion, but also about the original landowners and the land itself. check the photos you sent when we get home on Saturday. Best wishes. Tomas & Mya, Canberra, Aust. Rachel, Lekesha and Mandy enjoyed a day with Mike from Experience the Wild in and around Darwin. We shared our day with a lady from the Kimberley area in WA who is an avid wildlife lover and had a camera with a very big lens. She is a member of an international wildlife group who share their photos online. Experience the Wild offer both ½ day and full day tours. Mike explained to us there are different types of bird watchers and they try to offer the style of tour to suit the particular clients on the day. They cover a variety of habitats looking for as many types of birds as possible and if a client has a particular bird they hope to view they do their best to make this possible. We were on the full day tour and were picked up around 0715am in an air-conditioned 4WD that comfortably seats 6 people. Mike supplied us each with a pair of binoculars, a lesson on how to use them and we had cold water available at any time. Our first stop was at Rapid Creek looking for a particular type of owl that is attracted to the types of trees growing there. Then on to the Royal Darwin Hospital grounds. Here we followed the bike track, through the bush behind the hospital. Mike is very passionate about wildlife and his knowledge of birds and their calls is amazing. He often hears and recognizes the type of bird before he spots it. From there he drove us to the picnic area at Lee Point where we were provided with morning tea and then we went on to Buffalo Creek to view beach birds. Fogg Dam was next on our itinerary. The big wet season has caused the dam to overflow across part of the dam wall that we drove across. As the water flowed quite quickly into the floodplain it created an ideal feeding ground for the birds and so we had an excellent close look at them. The viewing platform on the far side of the dam was where we had lunch. Mike supplied us with fresh salad and cold meat on pita bread with a variety of cold drinks. A great added touch was the icy cold face washers to freshen up before eating. Our bonus to the fantastic view was a fairly large crocodile circling in a billabong right in front of where we were. Once back in Darwin we headed to East Point where we visited the Mangrove Walk, a bush walk through the reserve and lastly at the end of the road along the cliff edge again viewing the sea birds. Our day finished at about 630pm watching the sunset, with champagne, beer or a cold soft drink and nibbles at East Point. A nice time to chat about the day and relax before returning to our drop off point. Mike Jarvis met us at our Darwin hostel at noon and took us to six birding areas that afternoon. We saw shore birds, passerines, raptors, and many other Australian birds. He took us to parks, sandy beaches, mangrove swamps and forest preserves. All the birds were new to us so he helped with the identification and we added 30 lifers that afternoon. Mike also suggested other places to visit in the Northern Territories as we continued our trip south. Afterwards we treated Mike and his wife to an enjoyable dinner. They provided an excellent introduction to our visit to Australia and we recommend Mike without reservation. “I was birding in the Darwin area and had the fabulous opportunity to bird with Mike Jarvis. Not only is Mike good people and a gentleman, he is an exceptional birder!! He knows the birds and where to find them. My birding experience with Mike was not only adventurous, but each location proved well for the birds we were in hopes of seeing. If you get the chance to go birding or do a nature tour with Mike, make sure you do it!